Comcast was proud to help sponsor the Tacoma commemoration of the March on Washington, where participants walked from Tollefson Plaza to here, the Washington State Historical Society. So your first question is, if this was an August event, why is this post coming in November? The answer is that Victoria Woodards, the dynamic president of the Tacoma Urban League, was running for re-election to the Tacoma City Council, and we sure didn’t want to distract her until after the election. We hope you don’t mind this delay in a report. We didn’t see any coverage in the traditional news media, so we thought it was important to note that Tacoma celebrated the 50th anniversary of the March on Washington. Comcast was a proud sponsor. So we asked Victoria to write something, and here it is. We thank her for her words, and what she and the other people present at the Tacoma celebration do for the community. On Aug. 28, 1963, an estimated quarter of a million people marched from the Washington Monument to the Lincoln Memorial, in what turned out to be both a protest and a communal celebration. Dr. Martin Luther King Jr. delivered his legendary “I Have A Dream” speech which was the highlight of the march. This not only served to empower African Americans to continue the fight for equal rights, but it …continues to serve as an inspirational reminder that together, communities can overcome any challenges! 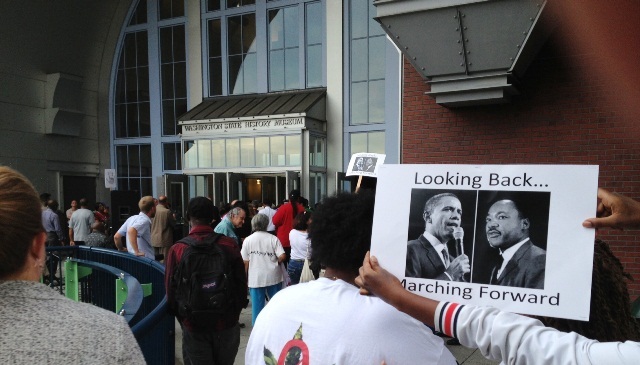 In honor of the 50th Anniversary of the March on Washington, the Tacoma Urban League held a symbolic march and discussion aimed at celebrating community, promoting equality, and providing resources that helped to ensure that the Tacoma community continued moving forward positively. Although the symbolic march only took place over the radius of three city blocks, the memory of tradition that the march was based on spanned for miles in the minds and hearts of the 300 citizens who participated. Participants engaged in discussion during which their voices were heard amongst Tacoma’s pioneer panel of speakers, and a conversation initiated that not only gave an outlet to areas of concern, but molded the minds of all who attended to raise awareness in some areas and initiate change in others. The overall outcome of the event was the emergence of a more unified group of individuals who were inspired to make a positive difference within the overall community.